Why must you know your target customer? 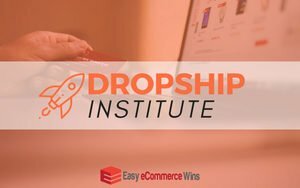 I’ll be the first to admit that when I started my first eCommerce business (drop shipping), I knew that there was a market for the products I planned to sell. I knew this because other websites were selling them. I identified that there were a certain number of stores selling what I wanted to sell and that the products met my requirements. If you’re curious about how we choose a niche, check out our Niche Selection Post. Ultimately, I was right, there was a large market of people buying the products that I wanted to sell online. At the time this was the extent of the research I did. I did product research and I did competitive research. But my research stopped there. We know from working with and coaching hundreds of eCommerce business owners that this is often where the buck stops. You have a great product that you feel someone will buy. You build a store and get started. If you are in this boat, you lack a deep understanding your target audience with the result that everything you do will be based on a bit of a scatter gun approach. Sure you will make some sales and you may even be profitable but you will never reach your potential and dominate the market you are in until you have that deep understanding of how to identify and reach your ideal customer with a laser focus. Doing all of the above will ultimately allow you to grow a raving and loyal audience who buy from you time and time again. The first step is finding your target audience is to know who your ideal customer is. What makes up the picture of who they are. We want to go further than saying “My target audience is 25-40 year old women living in the United States”. That’s helpful for sure but it isn’t enough to get us to where we ultimately want to go. We want to go deeper. We’ve broken down what you want to know about your ideal customer into five main areas. Start with the basics and go from there. Knowing this stuff can be incredibly powerful. We want to know; age, gender, geographical location, occupation, annual income, level of education, number of children. Sources of Information. Who do they rely on for information? This could be books, forums, blogs, magazines, influencers, social networks. Dreams & Desires. What do they want to achieve that is relevant to the products you plan to sell them. Sticking Points. What pain points do they experience that are relevant to the products that you want to sell to them? What pain points would your products solve? This could also include objections that they have to buy your particular product. What interests does your target market share?. What related interests do they share? Some of them will be obvious and others less so. We’ve put together a handy tool to help you keep all of this information in one place. 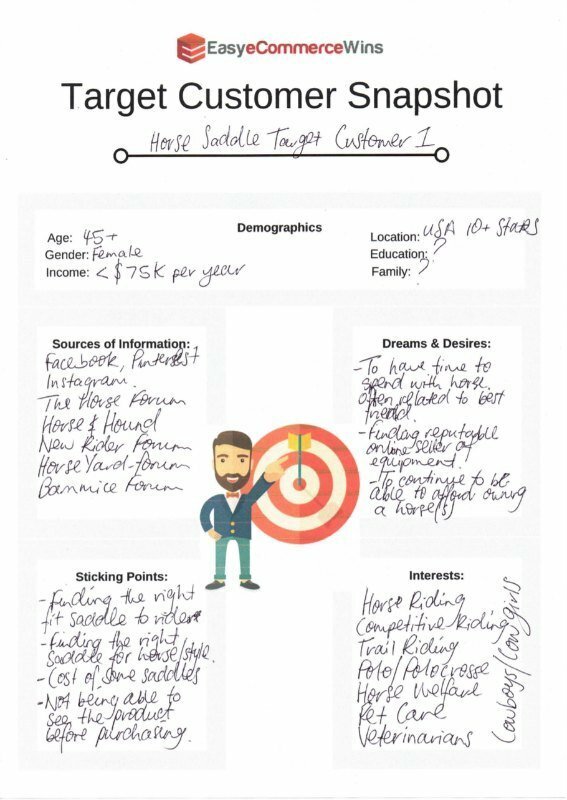 Download our Customer Snapshot Worksheet and use it whenever you need to identify a new ideal customer profile. We’re going to go through the steps to find the information you need and find your ideal customers online. I’m going to walk you through this using an example of a market that I have never sold in before and have no interest in; horse saddles. We are going to start by pretending that we are entering this market as a new eCommerce retailer, we don’t have traffic yet (we will cover where to pick up if you do have traffic later) so our existing pool of data is small to nonexistent. At this stage, I want to know everything I can find out about people who are in the market to buy a horse saddle. I want to be able to fill in as much of my Customer Snapshot as possible before I even design my website. We’re going to start by researching our target market’s demographics. This is the basic who, what, where of our target market. To get the ball rolling you can use a bit of your own judgment and some help from the big G (Google). As I am planning to sell horse saddles, I can make a fairly strong educated guess that a majority of my target market are going to be horse riders (some may not be). I will start with a simple Google search for “Horse Rider Demographics”. 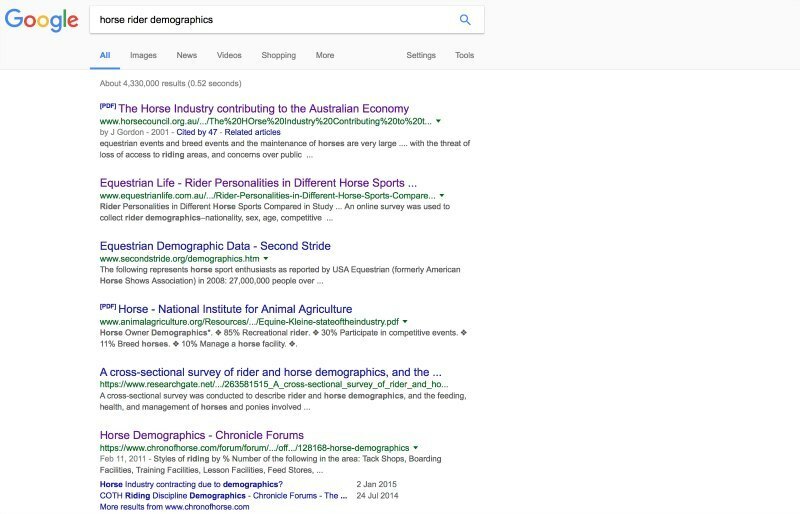 After a little digging on the first page of the Google organic results, I’ve identified a couple sources of information based upon surveys conducted on reasonably large groups of horse riders. This is a great place to start. What I am also starting to uncover here are answers to some of my other Customer Snapshot boxes but we’ll come back to that. I don’t yet have my Education level or Family information but we’ve made a good start. Now that I know more about the demographics of my target customers I’m going to move on to find out what some of their sources of information might be. Remember, here we are looking for blogs, forums, magazines, influencers, and social networks. We can do this in two ways, the first of course is by Google search. The second is by using a few online tools and some different approaches to find results. 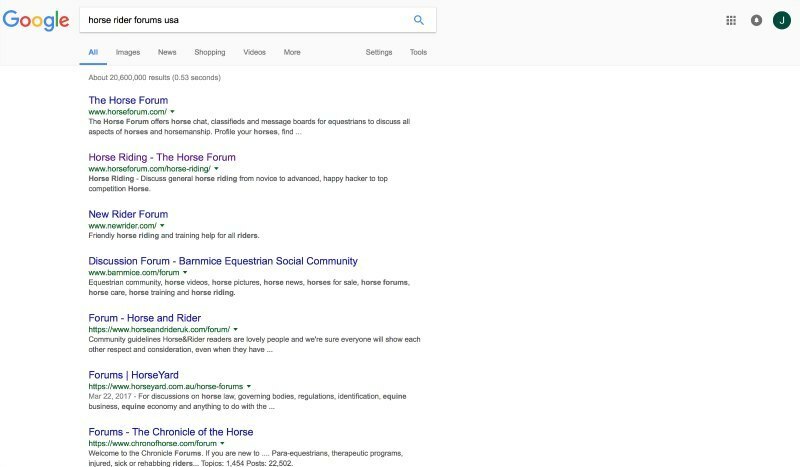 To start with the Google search method, I will do a search for “Horse Rider Forums USA”. As you can see, this has produced a good range of possible results for me to investigate. I would spend some time investigating at least the results on this first page. I’m looking for forums that demonstrate the frequent use and topics relevant to what I am selling. 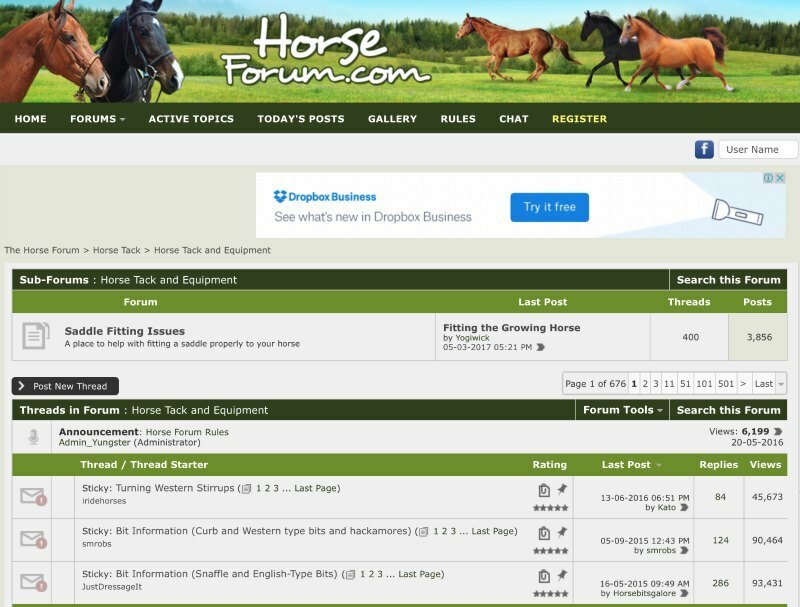 For example, the first result “The Horse Forum” actually has a sub-forum on Saddle Fitting Issues. This could be gold for me. I am going to repeat this process by searching Google for terms like “Horse Riding Blogs”, “Horse Riding Magazines” and so on. In combination with the above, I may also like to do more specific research into what sources of information may be relevant not only to my target customer but also to me as an eCommerce retailer. To find this out we are going to do a little bit of competition research. For our purposes here I’m going to assume that you have identified who your main competitors are online. It’s best to focus on those that are specific to your products/category. Don’t use Amazon for example. 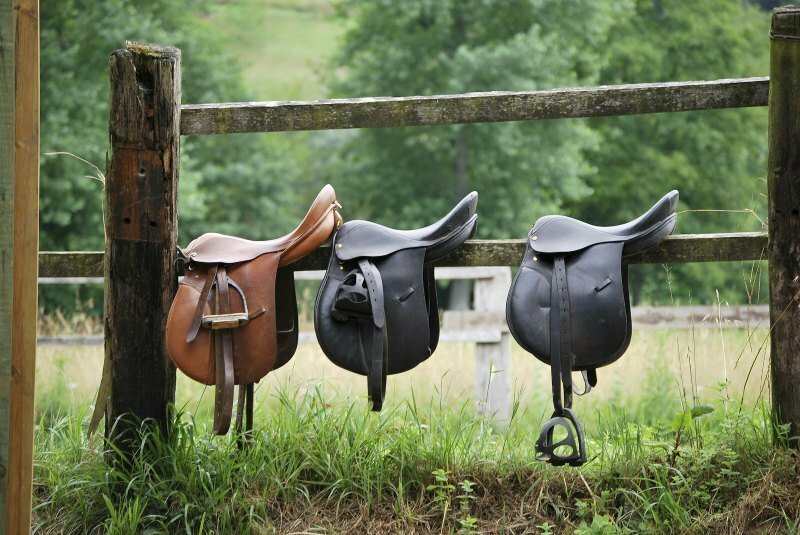 I am going to use Chick’s Discount Saddlery, an existing online retailer of horse saddles as my example. To carry out the research I am going to use an online SEO research tool called Serpstat. 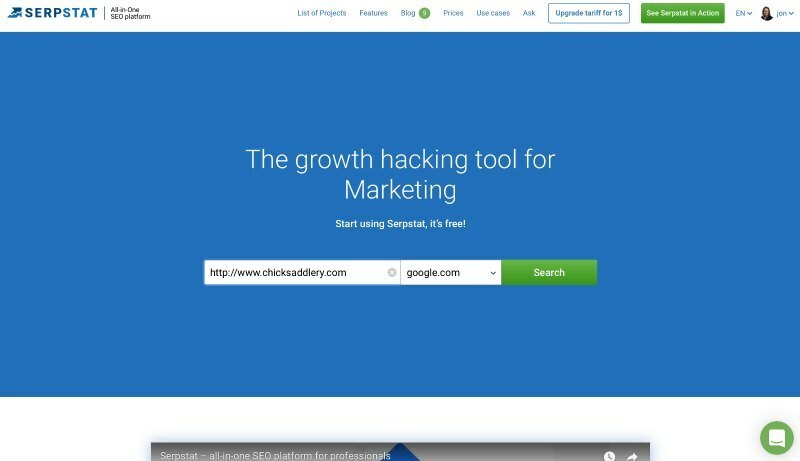 You could also use Ahrefsor SEMRush to get similar results. Each of these tools has a free version or at least a trial version, but for the best results, I would recommend getting the paid version (it will also come in handy in so many other ways). In the front page of Serpstat, I’m going to search for my competitors main URL. Using the full version of Serpstat I’m given 277 websites that have linked at least once to Chick’s Discount Saddlery. I will go through these now to see which of them would be likely places for my target customers to frequent. Once again I’m looking for blogs, forums and other websites where there may be a community of horse riders. I will add these information sources to my Customer Snapshot Worksheet in the Sources of Information section. The next tool that I am going to turn to is Buzzsumo. Buzzsumo is a content and influencer research tool that will help you to find popular online content and influencers for any given search term. Ahrefs has similar functionality if you prefer that tool instead. We can use the results provided by Buzzsumo to tell us what the current popular sources of information for horse riders are and which relevant influencers have the largest following. Once again to get the best out of Buzzsumo or Ahrefs, you really do need to have their premium version, luckily, both applications allow you to use this for 14 days free of charge with no credit card. So sign up and get started. You have a range of ways to use Buzzsumo to identify important sources of information and influencers in your market. My favorite are Twitter Influencers, Facebook Analyzer, Most Shared and Content Analysis. Experiment with each of these any you’ll unearth a treasure trove of useful info to help build your Customer Snapshot. Here I have a range of companies, bloggers, and influencers who have large followings on Twitter. I can filter these using the left-hand column filters if I want to remove companies for example. Now I may not be planning to have a Twitter presence in this niche but that’s not the point. Further exploration of any of these influencers will reveal that most also have presences on other social networks or websites that I would add to my Customer Snapshot. Researching your customer’s dreams and desires goes hand in hand with researching their sticking or pain points. When we talk about dreams and desires we are talking about their dreams that relate to your product. What dreams do they have that relate to your product and how will your product assist them in realizing those dreams. As an opposite, pain points are the things that are getting in the way of your target customer realizing their dreams. You want to be able to identify the ways in which your product or service will help your customer move past these sticking points to realize their dreams or desires. These things are much easier to answer once you have website traffic but you can still make a start on answering these parts of the Customer Snapshot Worksheet before you have traffic. Remember, a dream or desire is the opposite of a pain or sticking point. The customer is dreaming of what it will feel like to move past their pain point to the other side where the grass is greener. If you can identify pain points you can work from there to identifying dreams and desires. To get started with this research I turn to forums. I’ve previously identified a group of forums that are specific to horse riders and horse riding. I can also branch out here to test the big boys in the forum space; Quora and Reddit. After spending a short amount of time searching around I can find that there is a section on Quora devoted to Horses and Ponies and a Reddit devoted to Equestrian Riding. Both of which are full of people potentially in my market asking questions and sharing their pain points, dreams, and desires. Take some time to crawl through some of the forums that are relevant to your products and build out the Dreams & Desires and Sticking Points part of the Customer Snapshot. The final part of our Customer Snapshot Worksheet that needs to be addressed is the Interests section. We want to make a list of interests that our target customers may share. Once again, this can be a lot easier to develop when we have website traffic or a social following but we can make a start without these. I can pretty much assume a range of interests that are likely to be shared by people who are target customers for saddles. These would include horse riding, trail riding, competition riding, equestrian, horse breeding. These are all pretty much no-brainers. But what if I want to broaden my interest base? Given one of the main reasons that we want to know broader interests is to enhance our paid ads targeting on Facebook, it stands to reason that Facebook can help us improve our research. Using Facebook Graph Search we can uncover some great insights into our targets market’s interests. Earlier we identified a range of sources of information followed by our target customer. Included in this will be companies, influencers or bloggers who also have Facebook Pages. Let’s choose one. I’m going to start with the Horse & Hound Facebook Page. Horse & Hound is a horse riding related publication followed by over 500K people on Facebook. 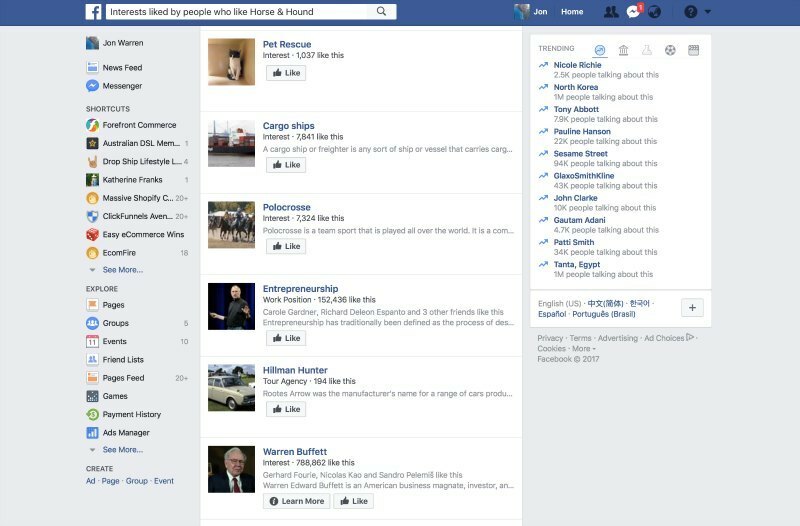 Using Facebooks’ Graph Search we are going to find interests shared by people who like Horse & Hound. While you will get some seemingly random results here, if you spend a bit of time sorting through the results, you will find a range of interests that are more closely related to your target customers. For example, in this search, I identified interests related to Polo, Polocrosse, and Horse Care. All of which I would think are likely to be interests shared by people who might be in my target market. You can take this Graph Search a step further by cross-searching interests shared by people who like two pages or you can search for people who like pages rather than interests. Experiment with this and see what you come up with, the more combinations you use the more specific your results will get. Finishing the Interests section brings us to the end of our Customer Snapshot. Here’s what mine looks like so far for my horse saddle business. You can grab your blank customer snapshot worksheet by clicking HERE. What if you already have traffic? If you are reading this post and you already have a website up and running with a steady stream of traffic you can definitely use any and all of the steps above to build out a Customer Snapshot. But, you also are in the fantastic position of having a range of other valuable sources of information to complete your picture. We’ll have a quick look at the best sources here. In this section, I am going to use an eCommerce store that I have run for some time, Chic Chandeliers (I can’t use horse saddles as I don’t actually sell those, that was a theoretical example). Google Analytics should always be at the top of your list when it comes to existing traffic research. 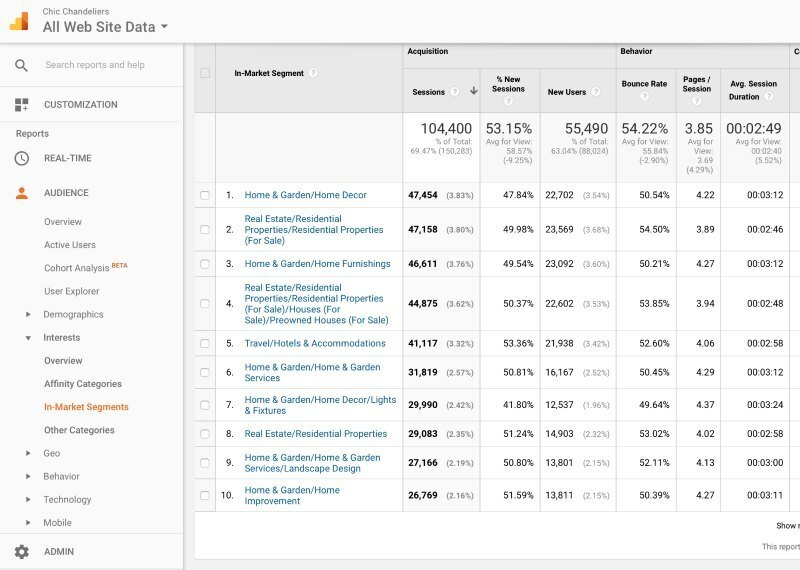 For filling out our Customer Snapshot we are going to use the Demographics and Interests reporting. Make sure you have your date range set to a good broad range. I’ve chosen 6 months here. Then if I flip into Interests>Affinity Categories I will get a list of Google Interest categories that my current customers fit into according to Google with all sorts of stats attached. 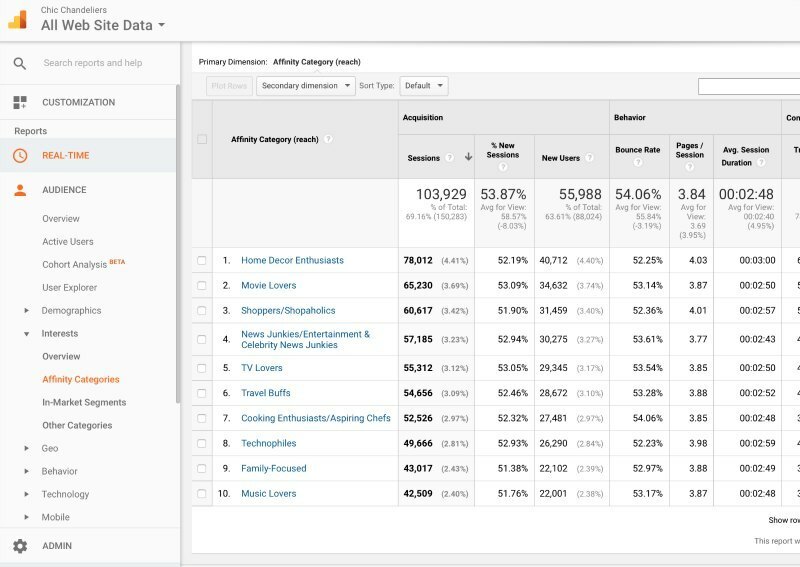 You can do a few specific things with this information; you can use these results to set up specific targeting on these Affinity Categories and In-Market Segments in Google Adwords, you can use them to build remarketing audiences in Analytics or you can draw conclusions about broader interests. For example, from here I can be pretty sure that my target customers are likely to be interested in Real Estate and Residential Properties for Sale. Check out what Google has to say about using GA Demographics and Interests. It’s a fair guess that if you have an existing eCommerce business your business will have a Facebook presence. The sheer size of the social network pretty much guarantees that most business owners will be able to derive some useful information from Facebook’s Audience Insights. 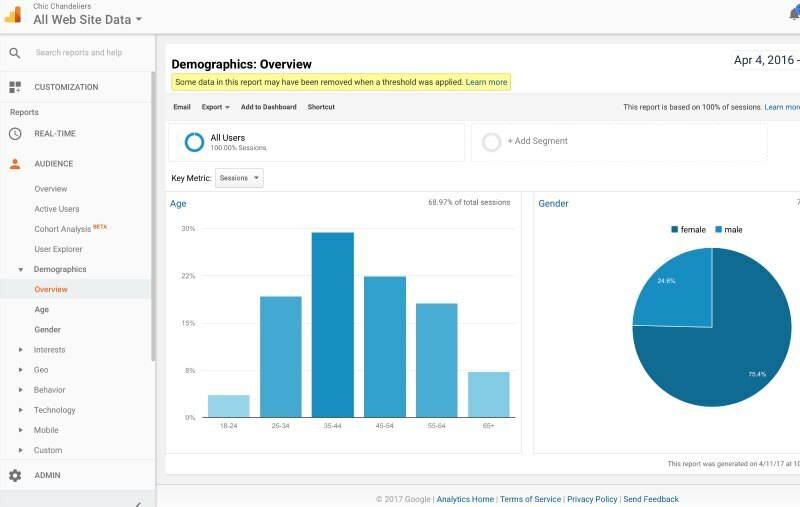 Audience Insights can be accessed through you Business Manager or Ads Manager interface. The reporting is produced by Audience. So you can have reporting done according to audiences you have already set up for advertising or you can have it done based on people connected to your page. 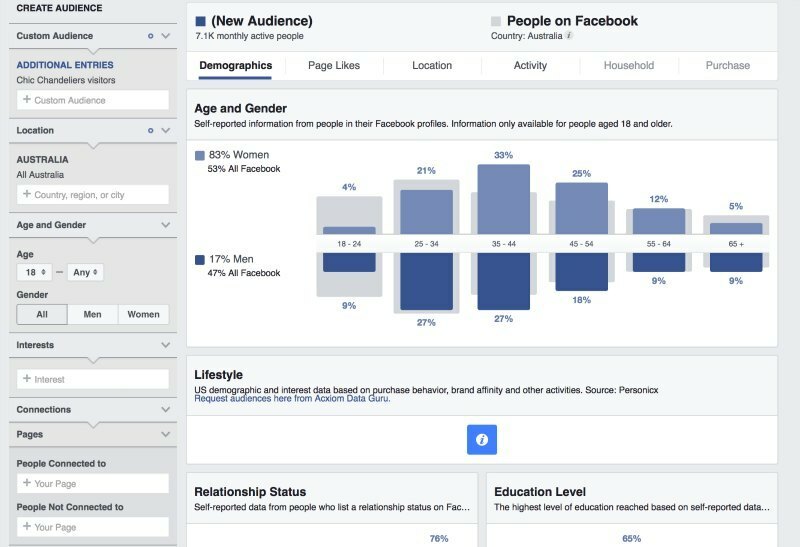 You can really dig into some fantastic information here; Age and Gender, Lifestyle, Relationship Status, Education Level, Job Title, Location, Purchase Behaviour, Facebook Activity, Device Usage and more. This information is extremely useful when building future custom audiences in Facebook for advertising and can even be used to help target on other ad networks like LinkedIn. Here’s a great, detailed post by Jon Loomer on using Audience Insights. This seems like a no-brainer and possibly a bit old school but I am constantly surprised that very few smaller eCommerce businesses don’t regularly talk to their customers. You existing customers are the ultimate source of information about who your target audience is and what they need, experience and feel. I like to use Typeform to build customer surveys as they have a really easy to use interface that I find it easy to produce fun and well-designed surveys with. Other great options are SurveyMonkey and Free Online Surveys. There is a definite art to building an excellent survey that elicits a genuine and meaningful response from the respondents, but a bit of practice and you’ll get the hang of it. Keep it short. 3 – 5 questions only at a time. Make it fun. Stick with the overall tone of your business but try to give people a good time while they are helping you out. Surveys can give you a level of insight into your target market that you just won’t be able to get from any other online source. If you already have traffic I recommend you start testing them today. I know my target customer. What’s next? You’ve put in the effort to build a comprehensive target audience profile. Now what do you do with that information? While there are many ways that this information can influence what you do, here are the 4 main ones. Now that you know some of the demographics about your ideal customer you can use this to influence how you build your website. A website built to sell to 50+ year old males will look and function fundamentally different to a website that is targeted predominantly at 18 year old females. Don’t feel that you need to reinvent the wheel here. If you are dealing with a market that you aren’t yet fully familiar with or that you don’t personally identify with, model off others. Find other websites that service the same demographics to you, and look at your competitor’s websites. What makes these different to the rest of the web? Are there particular functions, layouts or even color schemes that are common amongst these websites. You need to be unique but you can allow what works for others to shape your design. Your website content should absolutely be matched to your target customer. Now that you know your target market’s interest, pain points and dreams you should be developing content to meet the needs of your customer and deliver value to them around those needs. The tone of your content should also match your target customer. Once again, this is an area that you don’t have to re-invent the wheel on. You have just completed a range of research using tools like Buzzsumo and Serpstat. 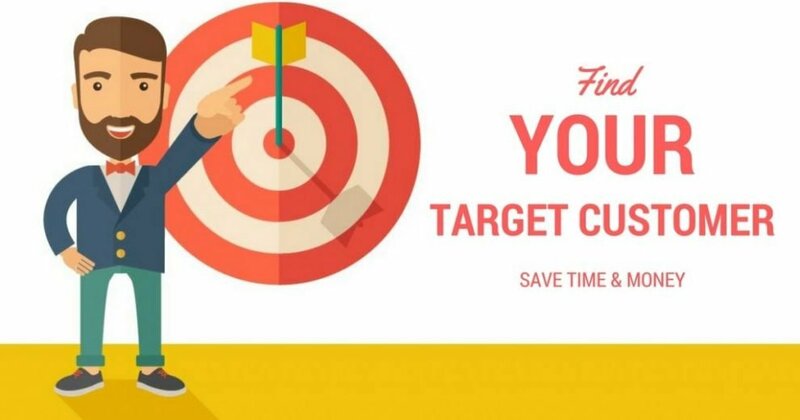 You found other websites, blogs, forums, publications and influencers who are already successfully meeting the needs of your target customer. Find the most popular of these and study what sort of content they are producing, what their tone and language is like and what pain points they are answering. Go from there and put your own unique spin on it. Your research using the Customer Snapshot should have given you a pretty good idea on which social networks your target customers are most active on. In my example I worked out that if I wanted to sell horse saddles to horse riders my time would be best spent building an audience on Facebook, Pinterest or Instagram…or all three. Look at the influencers that you have identified, where are they strongest? 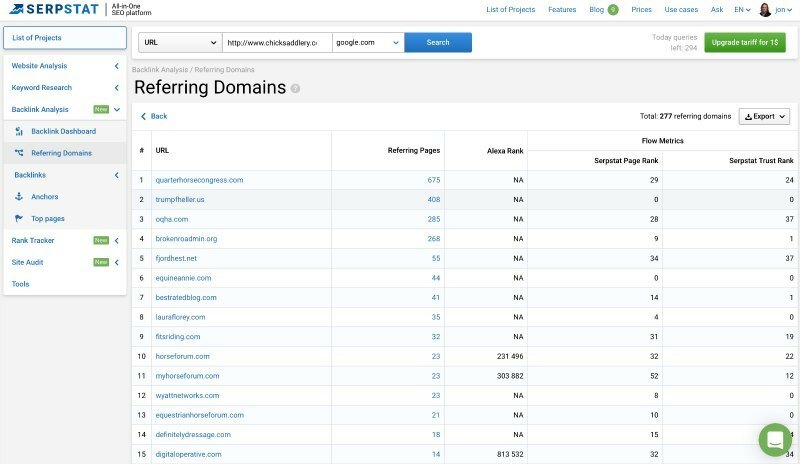 Use Buzzsumo to identify which networks are getting the strongest shares and interactions with the sort of content that you will be likely to produce. If you can’t see that your target customer is using a particular network then you don’t have any business being there. Perhaps the biggest benefit of identifying and researching your target customers is that it will allow you to drive targeted traffic to your site at a lower cost. If you don’t know your market, you might luck out. But more likely you will go through a period where you are constantly searching for the right audience until you happen across it. This means wasted time and worse, wasted money. Knowing your target market will also identify the less obvious and often cheaper sources of traffic. Thinking back to my original research on horse riders, I was able to identify 10+ active forums where I could not only organically interact with my target market but for the most part where I could pay to put my message in front of them. Identify Affinity audiences and In-market segments to advertise through using Google Adwords. Having as deep an understanding as possible of your ideal and target audience is one of the keys to a consistently profitable and long-lived business. Developing your Customer Snapshot Worksheet when you are planning a brand new business can be tough but you will reap the benefits long into the future. Knowing your ideal customer will influence everything you do and help you to avoid unnecessary activities and ad spend. In the long run, it will save you time and money. So grab your own Customer Snapshot Worksheet, and get started right away! How do you research your target customer? Have any additional strategies or tactics? Share them by leaving a comment.